On Monday's "The O'Reilly Factor," Bill O'Reilly took on the New York Times and defended "Fox & Friends" for their Photoshopping of Times reporter Jacques Steinberg. 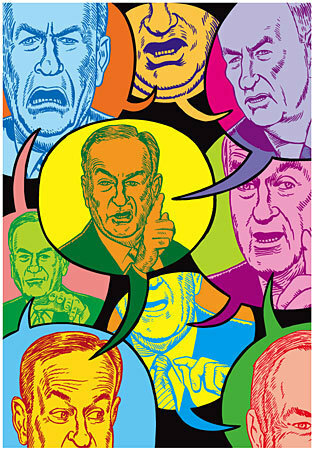 O'Reilly claims the Times caricatured him in a 2007 book review and called this "the most hypocritical situation we have ever seen." "Let me get this straight, New York Times-people" O'Reilly said. "We can't mock you, but you can mock us? Am I getting this? If the Times editor Bill Keller would wise up, perhaps their business might improve." Monday's New York Times featured a much-talked about analysis of Fox News' Nixonian PR strategies (F&F Photoshopped Steinberg's photo in response to a negative story he wrote about the network), and also alleged that the Photoshopping of Steinberg's picture was anti-Semitic.